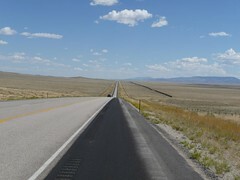 In 2009 I cycled almost 6000km Coast 2 Coast in the USA. Here are my tips and advice for cyclists planning a similar trip. To read my trip blog click >HERE< Of course all info here is based on my own opinion and experiences during this trip. Visa : Most people can get a 3 month visa via an electronic system for travel authorisation ESTA which you need in advance (and have to pay for nowadays). Make sure you know what you need before you travel or youĺl be sent straight back home. Check out the official visa site from the USA. Food and water : Appart from in the big deserts you won’t often be more than a day cycling from somewhere that you can get enough food and water. Petrol stations are everywhere and are a great spot to warm up with a cup of coffee or cool off in the airco with an icecream. I did often have problems getting healthy food (veg) outside of the big town, especially in the midwest (but maybe I was looking in the wrong places). America is the only country Iǘe cycled in where I didn loose weight. Beer : See my beer review >HERE<. 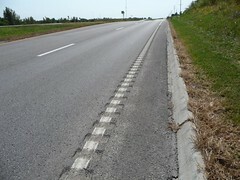 Roads : Long, straight (sometimes for 1000’s of miles) and generally in good condition, unfortunatly in recent years “rumble Strips”have been placed along most roads reducing the size of the “shoulder” by 40cm, this can be a problem on roads with almost no shoulder. Dangers and annoyances : Like most countries the biggest danger and annoyance is traffic. Americans are generally not used to seeing cyclists so dont look for you and dont know how to react if they do see you. RV drivers though often very friendly when camping (and often helped me out) once driving they become a nightmare, often forgetting to fold in their steps or lock their doors. 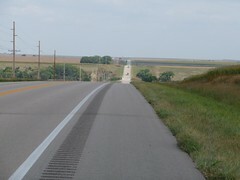 I almost got wiped out by a flapping RV door and a door step while cycling Trail Ridge Road. The biggest decission you need to make when planning a cycling trip in America is wether you want to follow an Adventure Cycling Association (ACA) route or do your own thing. Once you have the maps or choose a route you loose your flexibility to change route. You need to plan less. Its less guess working when thinking about food and water. You also have a greater chance of meeting other cyclists doing something similar to you. Non ACA Route: I chose my own route and used local “state maps”which only cost about $5 per state and often include limited info about state camp grounds. I chose to do my own route for the following reasons. I was flexible to change my route when I wanted or when I wanted to avoid the worst of the wind. I had a lot more chance meetings and hospitality from people who had never met a long distance cyclist. I wanted an adventure the old fashion way, and not follow a blog, published route or forum. Sometimes I regretted this choice but mostly was happy with my descision. Other: more and more theme routes are popping up now in the US, mostly converted railway lines, but very few are more than a couple of days cycling and they dont link up very well yet, in a few years this may become a good option. See Katy trail, Rails to trails, Erie Canal for some examples. Whats best? Thats up to you and what your want from your trip. If its your first big tour or first tour abroad then I recomend taking an ACA route. If youǘe already been around a while and want an little more adventure, you might want to just play it by ear/ wing it! Click >HERE< to see the route I took. Motels: Every possible price and quality from $25 up, I’ve used cheap and pleasant, to expensive and nice with nasty/nice ones at all prices in between, even one I walked away from because of the mushrooms growing in the carpet. RV type campsites: Huge boring sites with lots of facilites from $20-30 for a tent and bicycle. State parks : Varying size/quality/facilites and price. Most where ok to good. Prices from Free- $30. Wild camping: Free and in the middle of nature. Not always possible because of private property signs all over. But nice when possible. City parks: Many cities/towns allow you to camp in the city park, though get permission first to reduce the chance of getting woke up in the night. Usually free. Warmshowers.org: a great hospitality site for cyclists. I used this about once a week in America and all my hosts where great. Couchsurfing: Not my thing but I’m sure thereś plenty of couchsurfers in the US. Hospitality: Americans are really nice people and I got invited to dinner at a campsite and often got offers to stay with people.